BackgroundFew studies have reported the species composition of bacterial communities in marine biofilms formed on natural or on man-made existing structures. In particular, the roles and surface specificities of primary colonizers are largely unknown for most surface types. The aim of this study was to obtain potentially pioneering bacterial strains with high forming-biofilm abilities from two kinds of marine biofilms, collected from two different surfaces of the French Atlantic coast: an intertidal mudflat which plays a central role in aquaculture and a carbon steel structure of a harbour, where biofilms may cause important damages.ResultsA collection of 156 marine heterotrophic aerobic bacteria isolated from both biofilms was screened for their ability to form biofilms on polystyrene 96-well microtiter plates. Out of 25 strains able to build a biofilm in these conditions, only four bacteria also formed a thick and stable biofilm on glass surfaces under dynamic conditions. These strains developed biofilms with four different three - dimensional architectures when observed by confocal laser scanning microscopy: Flavobacterium sp. II2003 biofilms harboured mushroom-like structures, Roseobacter sp. IV3009 biofilms were quite homogeneous, Shewanella sp. IV3014 displayed hairy biofilms with horizontal fibres, whereas Roseovarius sp. VA014 developed heterogeneous and tousled biofilms.ConclusionsThis work led for the first time to the obtaining of four marine bacterial strains, potentially pioneering bacteria in marine biofilms, able to adhere to at least two different surfaces (polystyrene and glass) and to build specific 3D biofilms. The four selected strains are appropriate models for a better understanding of the colonization of a surface as well as the interactions that can occur between bacteria in a marine biofilm, which are crucial events for the initiation of biofouling. Initiation of biofilm formation in Pseudomonas fluorescens WCS365 proceeds via multiple, convergent signalling pathways: a genetic analysis. Populations of surface-attached microorganisms comprising either single or multiple species are commonly referred to as biofilms. 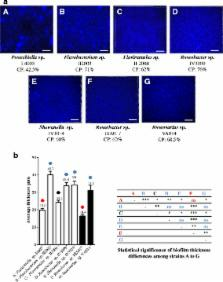 Using a simple assay for the initiation of biofilm formation (e.g. attachment to an abiotic surface) by Pseudomonas fluorescens strain WCS365, we have shown that: (i) P. fluorescens can form biofilms on an abiotic surface when grown on a range of nutrients; (ii) protein synthesis is required for the early events of biofilm formation; (iii) one (or more) extracytoplasmic protein plays a role in interactions with an abiotic surface; (iv) the osmolarity of the medium affects the ability of the cell to form biofilms. We have isolated transposon mutants defective for the initiation of biofilm formation, which we term surface attachment defective (sad). Molecular analysis of the sad mutants revealed that the ClpP protein (a component of the cytoplasmic Clp protease) participates in biofilm formation in this organism. Our genetic analyses suggest that biofilm formation can proceed via multiple, convergent signalling pathways, which are regulated by various environmental signals. Finally, of the 24 sad mutants analysed in this study, only three had defects in genes of known function. This result suggests that our screen is uncovering novel aspects of bacterial physiology. Prokaryotic biofilms that predominate in a diverse range of ecosystems are often composed of highly structured multispecies communities. Within these communities metabolic activities are integrated, and developmental sequences, not unlike those of multicellular organisms, can be detected. These structural adaptations and interrelationships are made possible by the expression of sets of genes that result in phenotypes that differ profoundly from those of planktonically grown cells of the same species. Molecular and microscopic evidence suggest the existence of a succession of de facto biofilm phenotypes. We submit that complex cell-cell interactions within prokaryotic communities are an ancient characteristic, the development of which was facilitated by the localization of cells at surfaces. In addition to spatial localization, surfaces may have provided the protective niche in which attached cells could create a localized homeostatic environment. In a holistic sense both biofilm and planktonic phenotypes may be viewed as integrated components of prokaryote life. Characterization of biofilm-forming abilities of antibiotic-resistant Salmonella typhimurium DT104 on hydrophobic abiotic surfaces. Toward automated analysis of biofilm architecture: bias caused by extraneous confocal laser scanning microscopy images.